If users mistype their email addresses, it can be very hard to get in touch with them. With the email address confirmation feature, such problems can be easily prevented. Step 1: Adding an email field. 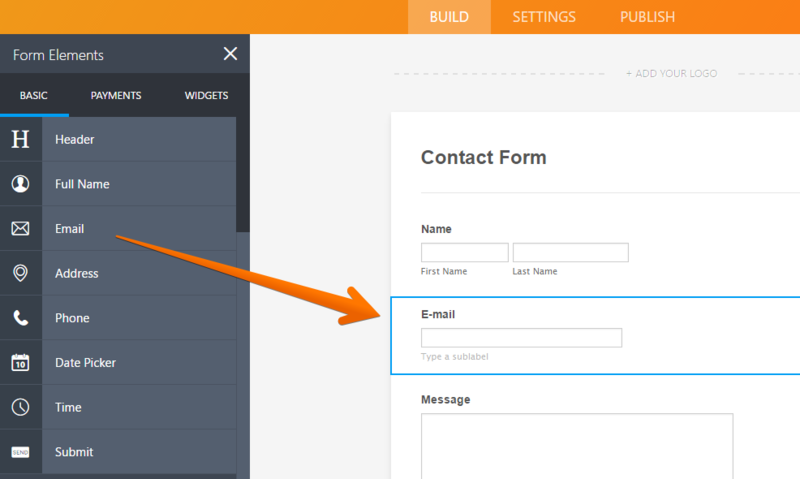 In your Form Builder, make sure you have added the "Email" field. Step 2: Enabling the "Confirmation Text Box". Select the email field and click the gear icon. That should open your "Email Properties". From there, click the "Options" tab and enable the "Confirmation Text Box". That will display a 2nd text box for email confirmation. Did you have any problems following these instructions? Tell us in the comments section below. is there a way to translate the verification mail,code that is being sent? I've recently started a web site, the information you provide on this site has helped me tremendously. Thanks for all of your time & work. "Everyone is responsible and no one is to blame." by Will Schutz. Is this a version of your software We're not aware of? Thanks! I'm curious about how I could add a feature to a form to require the form submitter to "verify" their e-mail address. For example, they submit the form, then get an autogenerated message which requires that they click a link to confirm that they received the e-mail. Is this feature still available? I followed this tutorial and there is no "confirmation" feature in "Show Properties." I have a General Settings tab, under which there is Question, Label Align, Required, Size, Validation, Max Size, Input Mask, Default Value, Sub Label, Hint Example, Hover Text and Read-Only. Confirmation in the show properties list, where has it gone? La mejor pagina de toda la web. Imprescindible, fácil de trabajar y muy intuitiva. Hello. First, this forms are by far the best I have ever seen online. Great job. I have a quick question. How do I create a password confirmation field? For example I request the users to provide a password but they need to enter it again tonfirm it. How can this be done? how to change the color of the type in a text box (confirm email)? The confirm email does not actually force the emails to match each other!